I was too harsh with my criticism of the sewing instructor in my Saturday post. There are a few tricky things about collars. Most can be learned by sewing a few though. I sewed my first collar in eighth grade, so my perspective will be different from someone learning how to sew as an adult. Plus I was a patternmaker for more than 10 years before becoming a stay at home mom. 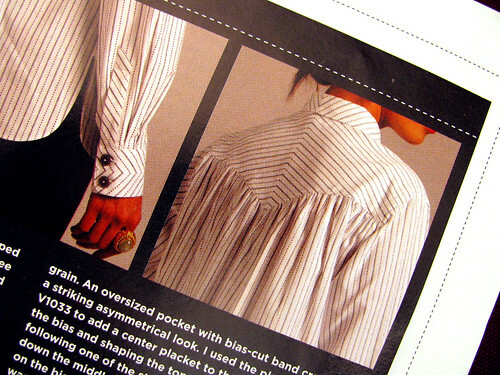 I bought the current issue of Vogue Pattern magazine yesterday because there was an article about making fine shirts. Some of the information is great. I loved the idea of the yoke cut with the grain parallel to the front edge when using striped material giving the yoke a chevron in the back. I also liked the detail of the cuff in the photo below. Some of the other information should be taken with a grain of salt though. Using really fine materials and threads is nice, but you can sew perfectly nice shirts using regular sewing thread. It just gets too expensive if you want thread in a color other than white. It just isn’t practical advice in my opinion. Sewing a rolled hem can be done with a lot more ease than the way suggested too. There is also a braided belt technique in the magazine I really like. The example photo in the magazine is black on black so I didn’t try to capture it with my camera. It is really pretty and different from a regular braid. If you happen to see the magazine at the fabric store turn to page 51 for a closer look. This entry was posted on Monday, June 1st, 2009 at 3:00 am and is filed under Sewing. Tagged: Sewing. You can feed this entry. You can leave a response, or trackback from your own site. Wow! That is a great detail. I will have to check out the magazine. I am getting my sewing mojo back as of late, so thanks for sharing!